Possible DROID sequel gets Wi-Fi certification? Besides the upcoming Motorola Shadow, there is talk of a sequel being produced for the highly successful DROID. 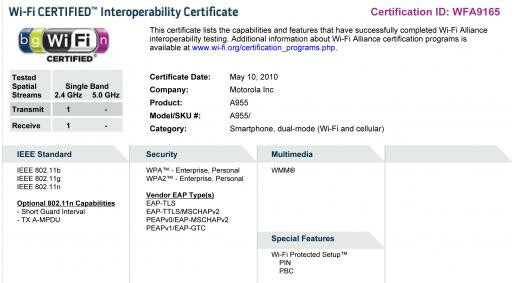 A Motorola model A955 has just received Wi-Fi certification. As many of you DROID fans know, that handset is the A855 so one might find it meaningful that this mystery phone has a model number exactly 100 points higher. Furthermore, Androidevicespy, a service that tracks the signature of individual Android phones, sent out an update about a device that appears to be a DROID 2 for Verizon. Sure, it is not as precise as hearing about it directly from Sanjay Jha or Lowell McAdam, but for now, this circumstantial evidence will have to do. I like Motorola Shadow 4.3 inches touchscreen on same body size of Motorola Droid. +1 for every reason except the forceful slide. I'm actually partial to that rather than spring-loaded. I'm convinced the shadow is the Droid 2, looks way too much alike. The "Shadow" cannot be the DROID2 since that 3d render came out literally a week or two after the launch of the DROID. I love the fact that Verizon is finally getting some great and highly anticipated phones..It's about time!